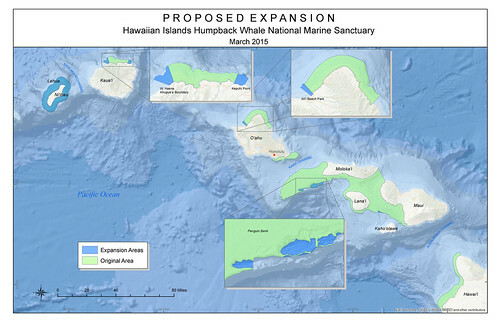 After nearly five years of work, 10 public hearings throughout Hawaii and the submission of 12,375 pieces of testimony, the National Oceanic and Atmospheric Administration (NOAA) is proposing to expand the Hawaiian Islands Humpback Whale National Marine Sanctuary, both in terms of geographic size and mission. According to the voluminous Management Plan Review Documents (posted online in March), NOAA is proposing that the sanctuary move away from an entity designed to protect a single species (in this case, humpback whales) and more towards what it’s calling “ecosystem-based management,” which I take as meaning that it would protect all the species (or “resources,” in NOAA-speak) in the sanctuary. To facilitate this, the sanctuary boundaries would expand to include 235.2 additional square miles (see accompanying map for where the expansions would take place). And to better reflect the new mission, the sanctuary name itself would change, to the “Hawaiian Islands National Marine Sanctuary–Na Kai ‘Ewalu” (the later portion of the name is a Hawaiian reference to the waters that both divide and connect the Hawaiian islands). ● April 29, 5:30-8pm: Kihei Youth Center, 131 S. Kihei Rd. Or you can mail written comments here: Malia Chow, Sanctuary Superintendent; 1845 Wasp Blvd., Building 176; Honolulu, HI 96818. Click here for a brief executive summary of NOAA’s proposed changes.